What drew you to the cello? Ever since I was a toddler listening to bits of symphonies and other pieces, I have had a connection with classical music. Though I went through a few different instruments, cello was the one that stuck. I think this is because it seemed to come easy to me and because of the support my mother (a cellist) was able to provide. I began cello at Ottawa Suzuki Strings and still attend there, playing many concerts every year. How many hours a week do you practice outside of rehearsing with the Youth Symphony? In the seven years I have played the cello, I have practiced almost every single day, reaching 1,500 days in a row at the longest. Each day I would practice between 30 minutes to two hours. I ended the streak this summer, however, as I am a senior in high school and have had to spend more time on schoolwork. What is your favorite part about being in Symphony Orchestra? Both the people and the performances. The venues that we play in are outstanding, ranging from Kauffman Stadium to the Kauffman Center. The orchestra members are friendly as well, which makes the experience especially fun. I have been in Symphony Orchestra for 3 years and have made a lot of friends in the group. This summer I look forward to our Austria trip. Do you plan to pursue a career in music? If not, what do you see yourself doing in ten years? After considering it heavily, I have decided that a career in music is not the path I follow. I plan to pursue international studies and geopolitics. What drew you to play the violin? How long have you been playing? Growing up I always heard music in the house. I liked the sound of the violin, especially violin concertos, and knew I would want to play them. That’s why I chose violin. I’ve been playing for almost ten years now. My main teachers have been Alice Joy Lewis at Ottawa Suzuki Strings, who was a founding member of the YSKC, and Kristin Velicer with whom I study now. 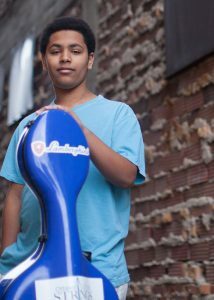 How many hours do you practice outside of rehearsing with the Youth Symphony? Outside of the Youth Symphony, I practice around two hours a day. What has your Youth Symphony journey been like so far? What is your favorite part about it? My Youth Symphony journey started when I was 13. I began in Academy Orchestra and made it into Symphony Orchestra in my second year. My favorite part is getting to play challenging repertoire with many of my friends. As of now, I’m not certain but I am leaning towards the possibility of being a professional violinist. I also love math. When did you become aware of the kids’ musical passion? My wife is a cello teacher, so Melaku and Bethlehem heard music lessons in our house from the time they were very little. I think at first, they were interested in music because they simply wanted to do what the other kids were doing. When we enrolled them in Ottawa Suzuki Strings, I think it really nurtured that interest. I became aware of their passion for music when I saw how excited they were to perform with other kids in that program. Suzuki connects young musicians with a common musical repertoire that they all know by heart. In what ways have you noticed music influencing Melaku and Bethlehem? In preparing music for concerts, Melaku and Bethlehem have made many friends and learned how to work together with them toward a common goal. They have learned that it takes daily effort and patience to become skilled at something; and as they’ve progressed, they have gained self-confidence. I have also noticed that they always appreciate the effort and talents of others. 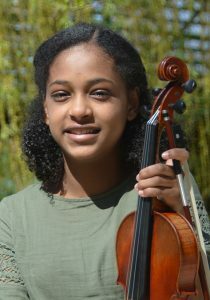 What does taking part in the Youth Symphony mean to Melaku and Bethlehem? Playing in the Youth Symphony of Kansas City became a goal for Melaku and Bethlehem as they became more serious about music. They knew that this group worked on challenging music and played at a high level. 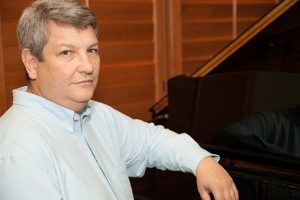 What they have found are music directors whose passion for the repertoire inspires musicians to achieve excellent results. It has been thrilling for them to play in a full orchestra in venues such as the Kauffman Center. What is it like for you to be part of a musical family? I studied piano and music composition in college and I married a professional musician. I never really imagined that our kids would be as interested in music as we were and that we’d have frequent conversations about what they liked about various classical pieces and composers. My interest in music might have faded over time, but my family has kept me connected to the first thing that I really enjoyed and pursued in life. It is highly gratifying to be able to share this activity with them.